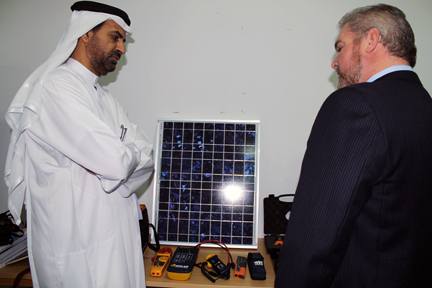 Solar Energy International (SEI) has partnered with PTL Solar Academy, Dubai’s first established renewable energy training institute, and The British University in Dubai, to provide the first on-site, hands-on introductory solar training of its kind in the United Arab Emirates. The training was recently completed in early February. SEI is part of the UAE’s first professional solar academy which opened this month with an inaugural class of 20 students, according to the organization’s e-newsletter. For more information on the solar training in Dubai, visit www.ptlsolaracademy.com. Within the UAE, Dubai has an ambitious target to achieve 5% power generation through solar energy by 2030, according to SEI. The Supreme Council of Energy recently launched the HH Sheikh Mohammed bin Rashid Solar Park designed to provide photovoltaic power of 10 MW by 2013 and 1,000 MW by 2030. Since 1991, SEI has been dedicated to hands-on and online solar training and renewable energy education in solar, wind, micro-hydro, and developing world technologies. The group also works with grassroots and development organizations to promote sustainability and improve quality of life worldwide through viable outreach programs. Along with UAE, SEI’s renewable energy training locations have included Costa Rica, Mexico, Nicaragua, Cuba, Haiti, and Sierra Leone, as well as many U.S. states over the last 20 years. Visit www.solarenergy.org for more information on hands-on workshops, online training, and outreach for a sustainable future. PTL Solar Academy is a non-profit educational entity that provides fundamental and hands-on training in renewable energy technologies and creates awareness to the wider community so they can make a responsible difference to be the change in powering sustainable growth. discussed for many years. Wonderful stuff, just excellent!